As a child I looked forward to trips to Fargo, North Dakota and spending time with my grandparents. Sometimes these trips were with my parents and siblings and sometimes I got to go solo. My parents had many friends who had left Fargo for Minneapolis. For us children our mom and dad could send us to Fargo with another family who were going to there for their own family visit. My Grandmother Erickson was a staunch Scandinavian Lutheran. 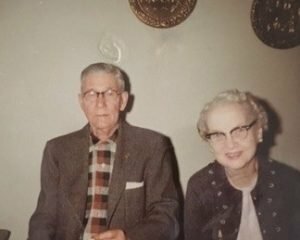 She was a first generation immigrant and survived living on the North Dakota prairie with a large family on a small homesteaded farm. She was raised finding solace in hymns, Bible scriptures and lessons from the Bible. She taught me hymns from the Lutheran Hymnal, Bible quotes, and recounted stories with a moral lesson as a child. 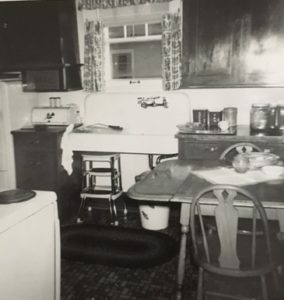 This was part of baking pies, swishing dishes in her big kitchen farm style sink filled with soapy water while watching her boil quart jars for canning fruit. She was no-nonsense and strident. Being attentive was my way of feeling close to her. I can honestly say that my grandmother’s interpretation of Lutheranism did not stick to me, however memorizing Psalm 23 did. In this climate of political change the phrase “Lead me to still waters” keeps coming into my consciousness. I cannot turn on the TV, read Facebook postings from friends, or engage in face-to-face conversations with friends without feeling despondent and wondering how to find those still waters. The still waters I visualize are waters that flow very slowly and calmly; bringing much peace and rest to my spirit. One of the most relaxing things in life is the sound of a bubbling brook or flowing stream of water… it is something that brings me to a place of calm, where I can focus without any distractions. I did not understand that interpretation as a child but the phrase did stick. Today I seek those still waters and I have watched myself find them. I have come to realize that without intentionality my “still waters” takes a number of metaphors in my life. 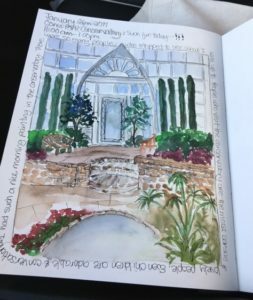 My sketchbook is a place where I can find calm and focus without distraction. I realize that when I open a page my mind will quiet and my hand holding a drawing tool will put my focus to something that brings peace and rest to my spirit. I draw not to create a masterpiece or something to frame and exhibit but to find a sense of peace. As I move through the days and months ahead the phrase “Lead me to still waters” will help me awake each day with the feeling of balance. 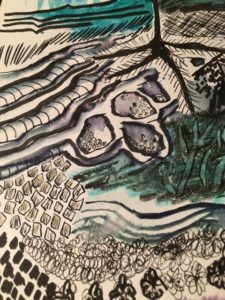 My still waters might be in my sketchbook, a donation to a non-profit under siege, or hands-on work with a group of like-minded organizations that need volunteers. I know that journey for still waters will “restore my soul.” In today’s word of political mayhem and Facebook posts I do not always see the goodness of people. In still waters I can, and then discern how I want to proceed. That was the lesson from my grandmother’s kitchen. This week, working with a team on an upcoming teacher workshop, we got into a conversation about “Studio Habits of Mind.” I won’t go into the conversation but to note that it got me thinking about my own studio habits of mind when I work in the studio. Engage and Persist: learning to embrace problems of relevance within the art world and/or of personal importance, to develop focus conducive to working and persevering at tasks. Envision: learning to picture mentally what cannot be directly observed and imagine possible next steps in making a piece. Observe: learning to attend to visual contexts more closely than ordinary “looking” requires and thereby to see things that otherwise might not be seen. Reflect: learning to think and talk with others about an aspect of one’s work or working process and earning to judge one’s own work and working process and the work of others. Stretch and Explore: learning to reach beyond one’s capacities, to explore playfully without a preconceived plan and to embrace the opportunity to learn from mistakes. Understand Arts Community: learning to interact as an artist with other artists and within the broader society. 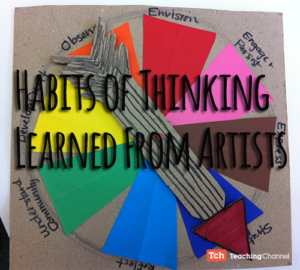 Habits are efficient- Once a habit is in place, artists and those in any creative engagement become more effective. The action that has now become a habit is smooth, elegant and energy efficient. Artists or others who are creatively engaged in a task and have developed efficient habits have become more of an effective creator. Habits are authentic- Habits tend to grow from positive impulses. When we develop a habit, the behavior associated with our habit is in tune with our inner condition. Our external habits are an eloquent self-portrait of who we are, of our creative idiosyncrasies. Habits change us- Habits can be transformative. If we think of a habit not as enacting a status quo, but rather as an outward expression that matches our inner condition, the habit is in sync with our self understanding. Habits support us- Habits keep us in balance. When learning or engagement gets tough, habits become part of our tools or a repertoire of ways to proceed. Source: Studio Thinking: The Real Benefits of Visual Arts Education, Hetland, Winner, et al, Teachers College Press, 2007. I have been taking a drawing class that has reminded me again about the importance of process. The most important rule for guiding children’s art activities is that the process is always more important than the product. This is true for adults as well. Process includes the space to explore art materials with freedom and without pressure. Process includes the freedom to experiment and enjoy the feeling of creating without being concerned with the outcome or the product. Process ends with creating something that is uniquely mine and not a copy of someone else’s. Process is best when it is scaffolded. Scaffolding is breaking up learning into chunks and then providing a tool or structure with each chunk. This week the process I have been exploring is the making of marks which is basic to drawing. Our first step was to explore possibilities through doodles. 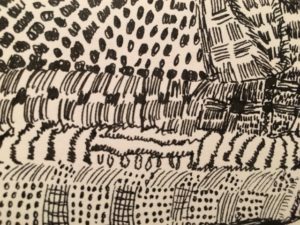 Doodling is simply the most playful, freeform type of drawing that exists. For the pure pleasure of drawing, doodling holds no boundaries and no rules. 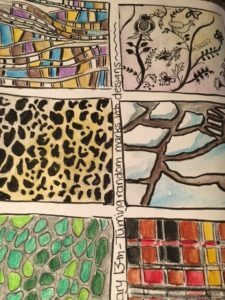 Sketchbooks provide the ideal venue for collections of scribbles, scratches, notes and ideas; all of which embody the spirit of the doodle. I was able to allow my subconscious mind to take over by filling a sketchbook page with my own dots, dashes, and scribbles. The second day was drawing objects that had texture and using marks to interpret the texture. The third day we used dots, dashes, points and scribbles to create solid shapes out of thin air. Using a folded stack of laundry the task was to follow a pattern across the shirt shape and describe it with marks, rather then outlining each piece of the pattern. By now I was getting weary of dots, dashes, and scribbles but willing to continue the week. Day four was thinking about how more formal patterns work in a design. The goal was to create patterns from magazine clippings. I had enough time to find six clippings and interpreted them in color. The culmination of the week was to take a field trip. I went to the Minnesota Zoo and found a nice corner that appealed to me in the Tropical Walk. I was feeling confident with the number of marks I had been working with all week. Not only had I expanded my vocabulary of marks but I had the opportunity to have seen the marks of others in the class. Using all of my materials, I created a drawing of the tropical area of the zoo only with marks-no line. 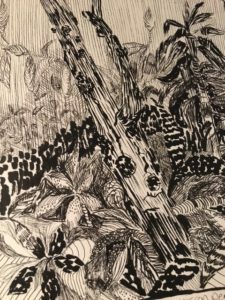 Drawing book author Mona Brooks writes about drawing being both a means of communication as well as a problem-solving tool. Through drawing I can see what I am thinking and also play around and transform my ideas. Drawing is part of a learning process rather than a learning product. It was a week of exploring and learning. Can’t wait to see what I learn from process next week! How students learn was always fascinating to witness in the classroom. It was an engaging and motivating question when planning curriculum or problem solving a student’s lack of engagement in content. The question was a linchpin for 30+ years in the classroom. I realized that the guiding principles for learning were as important for the classroom as for today with my own learning. I realize I need to use these principles as I continue to learn in the studio or learning in various art related endeavors such as selling work or having a website. Principle #1 Learners at the Center. For adult learners we need to remember to construct our learning through our engagement and personally driven and active exploration. The workshops I take, the self-regulated on-line class, reading, and my own field trips to museums keep me motivated and excited to keep learning. I know I am most engaged when I “mix it up” with how I learn. However, what I need to remember is to set goals for my active exploration and share and monitor those goals. This is more difficult for me. Principle #2 Learning is Social in Nature. Neuroscience confirms that we learn through social interaction. I learn so much more when I paint in a community because cooperative learning (a term used in the classroom) also pushes me to take more risks and to learn from other participants. I learn best with cooperative or collaborative learning mixed with the solitude of the studio. There is a lot of wisdom in a community of artists. Principle #3 Emotions are Integral to Learning. Emotions, motivation, and cognition are intertwined in learning. One of the strongest determinant to artistic learning is the nasty inner critic! The most destructive role that my inner critic plays is beating down my motivation to try something new, to continue to complete a drawing or a painting as not being “good enough.” In order to learn deeply I need to replace the inner critic to positive beliefs. When I accept what is not in my nature, rather than being distracted by all I think I could be or should be, then all my inner resources are free to transform me into the artist-self I am striving to be. Principle #4 Recognizing Individual Differences. I need to embrace my own style and not compare my work to others with “I wish I could do that.” We are unique. How I learn and how you learn is different. If I try to paint like the workshop instructor I will fail miserably. What is more satisfying and motivating is to take what I learn and modify and adjust the learning to my artistic style. One approach does not fit all. As one teacher stated, “Before we can be what we are meant to be, we must accept what we are not”. Principle #5 Stretching All Learners. Education is learning what you didn’t even know you didn’t know. Sometimes I need to stretch my learning. I am not a cartoonist, but it was fun to take a cartooning class with all the Anime cartoonists. A new world was explored and it was enlightening! (I left cartooning somewhere around the years of Archie comics.) Will I ever cartoon? Probably not. But, I did interact with a group of artists who I had more in common with than I thought. I learned about the artistic world of cartooning. Principle #6 Assessment for Learning. In the classroom formative assessment should be substantial, regular, and provide meaningful feedback. As a self-regulated learner I need to reflect for clarity of my expectations for what I am doing and “why.” Feedback is critical for me to maintain motivation. This principle is in play right now. I want to have a mentor who can give me meaningful feedback. Workshop instructors I have had do provide some feedback but it is a quick assessment for that moment. I want to find a mentor that can provide feedback about a body of work and over time. Principle #7 Building Horizontal Connections. In the classroom this is about transferring knowledge from one grade level to the next or one content area to another. When I taught color, psychology and the science of color was also important to understanding color in other content areas. How do musicians use color? Scientifically, how does light affect color? This principle from classroom learning is a little different for adult learners but application of an artistic experience from years ago will often come back to me in a new way in my own work. An important point concerning these seven principles: They are all important. In the absence of one, effectiveness cannot be maintained with a greater emphasis on another. This was true in the classroom and as I move ahead in 2017. I will remember to continue my own learning with these principles in my mind. Your Inner Critic is a Big Jerk: and Other Truths about being Creative. 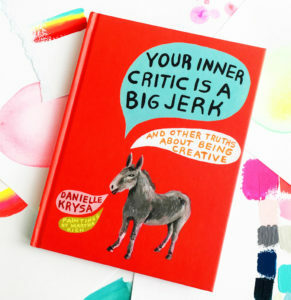 I just finished reading a fun book about the “inner critic” that plagues us all in different ways. It was written by Danielle Krysa. The illustrations by artist Martha Rich are fun and just in themselves chase away the inner critic with their whimsy. We all have an inner critic. The inner critic surfaces when we draw or paint, entertain a new idea or set a goal that is a push for us. Our inner critic seems to wait for these wonderful moments to intercede with doubts and rationals why we will not be successful. Blah, to the inner critic! 1. Give your inner critic a name. Choose something non-threatening like Gary, Lydia, Sheldon, etc. You might not always get along, but this trick turns that big scary voice in your head into a dude named Gary. Tell Gary to sit down and shut up, because you’ve got stuff to do. 2. Say Thank You. This sounds easy, but it’s difficult. When someone compliments your design, art, writing etc say THANK YOU, instead of responding with an itemized list of flaws! You might have to bite your lip at first, but every time you do this your inner-Gary loses some power. And, as a bonus, it makes you so much more pleasant to talk to. 3. Say it out loud. What does that voice say to you? Mine usually calls me an amateur. Write down the jab that your inner critic uses, and then say it out loud. Like, really loud, and preferably at someone else—a friend, spouse, co-worker. I know that sounds mean, and that’s because it is. If it doesn’t feel good to scream it at someone else, then why on earth do you scream it at yourself? 4. Write it down. After you yell those mean words, grab a scrap of paper and write them down. Next, flip your paper over and write the positive opposite. For example, mine would start with, “You’re an amateur—you have no idea what you’re doing”, and would become, “Everyone starts out as an amateur—the only way to become an expert is to keep going every single day, which is exactly what I’m going to do.” Pin that up on your wall, and repeat this process whenever the I.C. says something mean. 5. STOP MAKING EXCUSES! Every time you make an excuse not to be creative or work on your goal—i.e., you need to get groceries, I will start tomorrow, my house is too messy—your inner critic has the upper hand and is winning. So I am going to take my excuses, write them on pieces of paper and throw them in the garbage can with the smelly tuna fish can and soggy coffee grounds. I will get out my sketchbook and draw everyday because I love it, finish the half done painting and follow my “thoughts” for what I want to do next. 2017 will be full of days when I just make stuff! !